In this post we explore a practice strategy that enables you to make patterns sound natural and flow into the rest of your soloing. A very traditional recommendation for improvisation practice is to practice melodic patterns. And it’s true that they can help, but only if you practice them the right way. 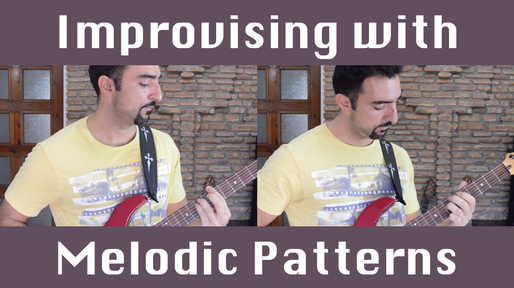 Some patterns are associated with classical technique practice , others with blues or rock, others with metal, others with jazz, but the reality is that any pattern can be used in any style. I remember when I first started practicing these things years ago. I was fresh in college and wanted to catch up with all the best sax players and the piano players and all the amazing improvisers I saw around me. So I followed the common wisdom and started practicing patterns. The first one was groups of four... This was so boring! But 90’s American TV came to the rescue. I practiced while watching "Seinfeld" and "Frasier" and "The Simpsons" and the "Fresh Prince"... TV, metronome, guitar, all at the same time! I drove my room-mate crazy. But anyway, I really did improve in playing these patterns, but my improvement was mainly technical. I had the muscle memory and some speed, but I just couldn’t understand how to allow these to flow freely in my soloing. This was frustrating and I saw results only after I did them a zillion times. The practice worked, but I would never call this effective music practice. It really took me a few years before I realized what I was doing wrong. I needed to start thinking as a teacher in order to figure out how to help my students transition quickly from just playing these patterns to making them a part of their musical vocabulary. Just playing them over and over can work (I proved that), but it’s a huge waste of time and energy. First, you need to understand that starting the pattern is not really a problem. You can experiment with starting on different beats and so on, but the pattern will sound good just because of its sound. The problem is getting out of the pattern, so we need to zoom in and practice that specifically. If you just start playing the pattern and then stop, it will sound like an exercise. What you need to do is to add what I call a “tag ending" to it. In other words, improvise a simple melody using your scale, to help your phrase “land" safely. The example I played in the beginning of the video is taken from the second lesson of 3NPS Pentatonic Speed Patterns. I play this 8 note pattern, I begin on different beats, I change directions randomly and add a tag ending to each phrase. Now that you know what’s happening, I recommend that you watch it again. Well, I hope you find this helpful. If you do, please share, like, and subscribe. You can also join the EMP mailing list and get more free lessons including Free Access to the complete 3NPS Pentatonic Speed Patterns online course. Have fun with this and let me know in the comments how it worked out for you.